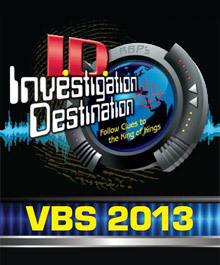 Investigation Destination super kits are available at www.RBPstore.org/ID. Challenge your students to prepare for the return of the King with this five-lesson Vacation Bible School resource, as they investigate Biblical accounts of Christ in action. Use this kit during the school year in any five-period time frame. The kit is a great opportunity for ministering to every age—all while using trusted RBP material at a great price! Exceptionally priced at $169.99, this kit includes multiple student and teacher books for each age group (age 2–adult), as well as promotional and attendance material—a $540 value. Also available are decorations and additional Investigation Destination resources, such as a specially priced ID Puppet Bundle for only $29.99. Limited quantities are available. Order your Investigation Destination super kit today! Posted in Classifieds, e-INFO, February 2014 on February 13, 2014.